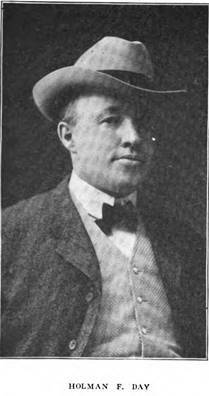 Holman Day was an author who appeared in “Blue Book”, “Short Stories” and “The Popular Magazine”. I found a biographical article about him in the Lewiston Journal Sunday Magazine, January 18, 1969. It started with a reference to his home. I found a picture of it on Google maps, looks amazing. The interiors look even more amazing - take a tour of the house here. Every day the normal flow of traffic swishes by the Victorian-style house that stands on the corner of Goff and Court Sts., and the drivers seldom take a second look at it. But each year, when the magnolia tree beside the granite steps unfurls its pink and white parasol, the house seems to come alive. With its gingerbread trim and lower rooms it is representative of the age when even embellishments were embellished. It is even more important historically for it was the home of Holman Day, Maine's homespun poet. 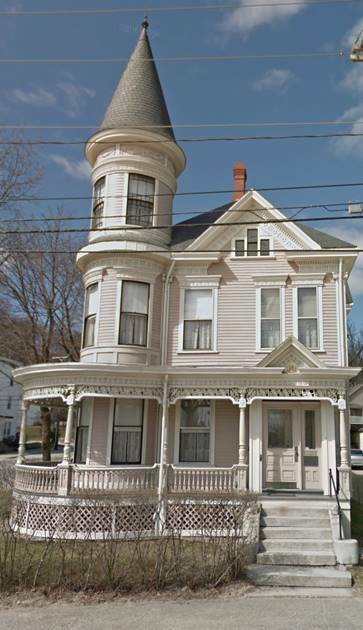 He lived here during the 12 years he was on the staff of the Lewiston Evening Journal; and in this house he wrote many of his 300 stories that were published. His first novels were also turned out at this address. Newcomers to this community and the younger generation may not have heard about Holman Day but not only did he capture the vernacular of Maine people, he understood the folks who lived in our little hamlets. He laughed with them but never at them. Through his novels he challenged the destroyers of the wilderness, the pompous politicians, and others who manipulated the lives of every-day people. He skillfully deflated their hypocritical balloons of feigned benevolence. Holman Day knew Maine, he loved Maine. And he became the spokesman for her more humble citizens. He was the sort of a boy who 'went barefoot as soon as the snow was off the ground. He played hide and seek with the neighborhood kids. His happiest early school memory was opening the lunch bucket his mother had packed with delicious goodies. His home town, Vassalboro, was a small village on the Kennebec River. His grandfather William Anson Day, came to Maine from Boston right after the Revolution. Holman's father. John, was a natural born story teller, he had plenty of tales to tell, too, for he served with the Third Maine Regiment in the Civil War so General Oliver O. Howard was his Commander. The boy's mother, Mary Day, was the daughter of Allen and Mary Chadwick Carter of Etna. She must have led a busy life with three lively sons around the house. Holman Francis, the second son. came into the world on November 6. 1865. One neighbor recalled during an interview that Holman Day was always a bookworm Even when he was a little fellow he had rather read than play and fortunately his parents encouraged him. By the time he was 14 years old he was writing his own newspaper with pen and ink on foolscap, he called it the "Weekly Vassalboro News” and many of his father's stories were grist for his mill. When he entered Oak Grove Seminary his horizons began to broaden. Then lie spent a year at Coburn Classical Institute in Waterville before entering Colby College. While there his crust of shyness began to melt and his sense of humor emerged to become the dominant feature of his life. Arthur Staples, noted Editor of the "Lewiston Evening Journal" said of Holman Day: "Humor was the controlling factor of all he did throughout life." Another journalist said he had an almost overdeveloped sense of humor. In 1942 Ivan Sherman wrote in his Master’s thesis that "the dominant feature of Day's disposition was not always a happy one. He had no sense of fair play and could never appreciate a joke at his own expense.” Doubtless each statement was correct and the opinions expressed were colored by the critic’s own personality. But it seems logical to assume that the statements made by his contemporaries were more accurate. indicated that he was an admirer of Wordsworth and his essays were obviously colored by Emerson’s influence. In view of his facile writing ability, it is not surprising that Holman Day was chosen to write and read the class poem for his graduating class. His first journalistic position was as an apprentice on the "Fairfield Journal”. He was paid $5 a week for writing editorials and taking care of his employer’s horse. Young Day discovered that there was quite a contrast between college journalism where one worked in a scholastic atmosphere and used a fresh pen on nice glossy paper, and the confusion of a newspaper office where items were scribbled with a stub pencil on the back of handbill blocks. It was at this time that his own style of homespun writing first appeared in a column called "Evenings in a Country Store". His boss suspected that his writing was cribbed because "Anyone who can’t clean off a horse any better than you can wouldn't know enough to write such like." Within a few months Day answered an advertisement in a Boston paper. He was accepted and so he became an Editor on the "North Adams Sunday Express.” The thrill of being a big city newspaper man soon evaporated: and his pangs of homesickness for the good old State of Maine became so unbearable that he chucked his job and came back home. In the winter of 1887-88 he was the Managing Editor of the Union Publishing Company of Bangor, putting out several weekly rural newspapers in Penobscot and Hancock Counties. His writing revived the circulation somewhat but the financial condition of the company was so weak that it failed within a few months after he joined it. Nearly every reporter breaks out in an itch to publish his own paper and Holman Day was no exception. In July of 1888 he and a young printer Edwin Bunker, joined forces and bought the "Dexter Gazette" for $500. In youthful optimism they also acquired the "Monson Weekly Slate.” And the “Eastern State". The consolidated publications appeared as the “Eastern Gazette”. During the next four years Day lasted the heady wine of editorship and the bitter gall of financial embarrassment so to supplement his income, he became a correspondent for several Maine newspapers. His colorful accounts of Down East characters, both factual and legendary, made his by-line a real attraction. It always meant good reading. Harry E. Andrews, managing editor of the “Lewiston Evening Journal.” had a knack for discovering latent talent. He spotted Holman Day's stories and made him an offer and Day didn't hesitate to exchange an uncertain livelihood for a dependable salary. Andrews made him the Manager of the Lewiston paper’s Portland News Bureau. Within a year Andrews transferred Holman Day back to the main office where he became the “State of Maine Correspondent" for the “Journal." Although he was given specific assignments, he was also free to pick up feature stories whenever he discovered them. This type of work exactly suited Holman Day. He liked to travel, he loved variety, and he enjoyed meeting all types of people. His Editor, Andrews, taught him to become aware of the wealth of material to be found. This was an impressionable period for Day and his association with the “Lewiston Evening journal influenced his remaining literary work. Andrews was a friendly and discerning critic of Day's writing. His successor, Arthur Staples, recognized the young man as one of the most gifted newspaper essayists of his generation although he had journalistic limitations. Staples recalled that he was an eager, talented youth, gifted beyond measure with the art of saying things without offense and of lining a point by fun making. Alice Frost Lord, an award winning newspaper woman who is on the “Journal" staff for many years, recalled Holman Day as sitting on the edge of his desk In the old “Lewiston Journal" block at the head of Lisbon St. swinging his free foot and spinning yarns for casual callers or members of the staff. A wealth of Holman Day material was recently collected by William H. Houpt, author of "Maine Long Logging and Its reflection in the Works of Holman Francis Day". This is the source of many of the quotes in this article. "There wasn't a hamlet in Maine where Homan Day didn't have friends who delighted in his company and took pride in knowing him,” said Henry Dunnack, a Maine State librarian. His stories of “The Spider House"; the horrifying life on Malaga Island, his accounts of rs(illegible word) and reports of murder trials are still unsurpassed. His whimsical word portraits of fellow residents were three dimensional because he used their own pattern of speech in an authentic and sympathetic manner. It was never exaggerated by weird spelling or artificial phrases. Today we can read his poems and hear our grandparents speaking again. Listen to a bit of his “Ballad of Joe Pluff." Knowed enough to doctor hosses, cows and dogs an’ hens an sheep. When he came to doctor humans, wal, he wasn't quite so deep. Yes, Holman Day knew and loved Maine's old time characters. As he traveled he kept a “case book" in which he jotted down incidents, phrases and scenes that might be useful later. In his newspaper accounts ; admitted that he elaborated, and liked lo dress things up to emphasize a point but he never denied that he did this. His “Journal" readers were his severest critics. They looked at their own Down East prejudices which they cherished, they searched for, and found, the mores that arc peculiarly Maine. John Gould said “Seventy five years after they were written, any of his essays arc as much appreciated as they were when freshly published." Yet at the very peak of his success on the Journal, he became restless. He was tired of travelling. He longed for higher horizons. 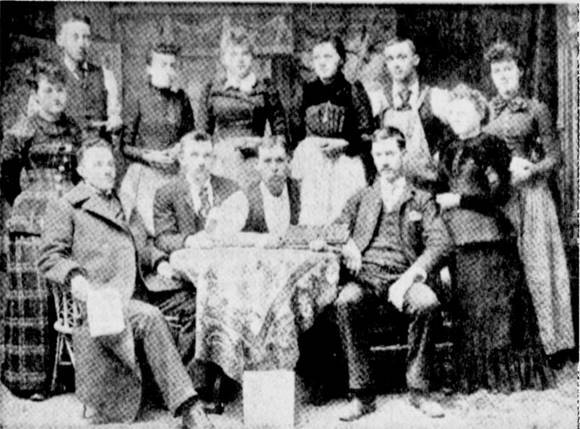 In 1897 he resigned from the Lewiston paper and joined the staff of the “Bangor Commercial". He was also the Eastern Maine correspondent of the “Boston Herald." This was a well paying position and a good correspondent could earn much as $200 a month even in his early years. Yet this type of work did not make him happy, either. When doing some folk writing he hated to leave the typewriter to track down some current news item. Sam E. Connor, a prominent Maine newspaperman and member of the "Lewiston Evening Journal" staff, said: "Holman was a special writer, a feature writer, never a news getter. He couldn't see a news story but he could see an idea that offered a base for a funny story. Give him the facts and he would pull together a readable yarn to make one laugh or to start the tears." As "Boston Herald" correspondent Holman Day scarcely earned his expenses, and now another cloud was shadowing his life, he had too great a fondness for liquor. His behavior and professional status was afflicted by this habit. It was also responsible for much unhappiness in his home. He married Helen R. Gerald, daughter of A. F. Gerald the electric car tycoon of Maine and they had one daughter, Dorothy. After his first wife died in 1902 he married Agnes Bearee Nevens, daughter of Byron and Ella McDouglas Bearee of Lewiston. She was artistically inclined and was Superintendent of the Maine State Art Exhibition for several years. "He found that there was so much fun to life that work was sometimes secondary" said Staples. "As a result he was easily diverted from his task at hand." Once again he became uneasy. Resigning from his Bangor position he came back to Lewiston as Managing Editor of the "Lewiston Daily Sun " It soon became evident he was misplaced and be transferred again to the staff of the "Lewiston Evening Journal" This time he was assigned to write a daily column called, "Up In Maine." Under the heading "Slate Chat", this column still appears weekly in the "Lewiston Evening Journal Magazine", thanks to the perceptive personality of Arch Soutar, Stale Chat Editor. This time Holman Day rang the bell. Staples asked him to turn out poems to head the column. For several years Day ground out verses by the bushel. The poems read as though they were turned out effortlessly but they were as carefully crafted as his deadline limitations permitted. They reflected New England obstinacy, tolerance of the unconventional, self-reliance, quiet courage in adversity, and dry humor. Other editors recognized his talent and lifted his poems from the "Journal." They were republished in the “Boston Globe" and numerous other papers. He became a household poet from Boston to Fort Kent. Children memorized his verses for school. They were recited at Grange meetings and church socials. Staples said that had Day stuck to them he would have ranked with James Whitcomb Riley. In 1900 these verses were published in his first book entitled “Up In Maine" after his column. The first edition of 2,000 copies was quickly sold. Within 10 years more than 30,000 copies had been purchased and mailed, or carried, by Maine folks all over the country. He wrote rapidly, accurately, and culturally. He was not deceived about the literary excellence of his verse. He realized that they were jingles. They were not meant to be literary. They were written for his friends, the common folks of Maine. When his book was praised he would reply. “T'aint poetry, I tell you. T'aint poetry, It's just verse." With all these homely notions in my brain. Let’s have a chat 'bout common things in Maine." His second book of verses appeared two years later as "Pine Tree Ballads." This showed technical improvement and increasing literary maturity. A “New York Times" review said; “Some of these poems have the vigor and dash of Kipling." Day s third and last book of verse was published in 1904. “Kin O'Ktaadn" had prose introductions. By the time it was on the market he was in Boston again as a member of the staff of the “Boston Journal". Frank Lovering, the Managing Editor of this paper and now frequent contributor to the journal Saturday Magazine said; “It was Frank Munsey's money that hired Holman Day. He received an impressive salary." If he had forgotten his aversion to metropolitan life he soon rediscovered it, then, like a homing pigeon, he came back to the “Lewiston Evening Journal". But nothing was the same for him. He had already sold short stories to “The Saturday Evening Post", "Collier's", “Cosmopolitan", “The Youth’s Companion", and “Everybody's". Feeling that he was ready to concentrate on fiction, he severed his connections with the “Journal" for one last time and retired to his home at the foot of Guff Hill in Auburn. His first novel, “Squire Phin" was very well received. It was the story of a small town lawyer. But Holman Day always disliked tedium and he found that it was much more difficult to write a full length novel because he was trained to write brief, crisp essays. When he was writing his second novel, “King Spruce" it is said that his wife and a representative from his publishing company stood over him proofreading his work as fast as he turned it out. “King Spruce" was the book that the “New York Times’’ hailed as; “A new phase of American romance. A stirring story told with force, simplicity and humor. For the first lime a Down East author made the Maine lumber industry the background for a major hovel.” This book was rated as Holman Day’s finest. Some of his other books are “The Eagle Badge," a juvenile story; “The Ramrodders”, a tale of contemporary Maine politics, it attacked Prohibition and its political corruption; "The Skipper and the Skipped," his most humorous novel. It tells about the vicissitudes of a retired mariner. “The Red Lane" was published in 1912. This book featured a French-Canadian personality and its setting was along the Maine-Quebec border. The boys of the U S. Customs Service provided the action. Lewiston-Auburn readers were especially interested in "The Landloper" which was based upon the Auburn Water Company litigation In 1916. “Blow the Man Down" appeared as a marine romance in which he wrote about the ocean as a symbol of the impersonal contest of nature against man. His next book, “Where Your Treasure Is," was also a sea story. "The Rider of the King Log" was his last major literary success. Whenever he wrote about the Maine woods and lumbering he was on solid ground. Again he received accolades from the "New York Times." He also wrote "All Wool Morrison," "When Egypt Went Broke," "Joan of Arc of the North Woods", "Leadbetter's Luck", "The Loving Are The Daring," "Clothes Make the Pirate" and "When the Fight Begins." "Squire Phin" was dramatized posthumously in 1941 as "The Circus Man". Day himself tried playwriting and his three act comedy "Along Came Ruth" was published by Samuel French Inc. in 1930. He was quite affluent in 1921 so he decided to form his own film company. His partners were Blaine Viles and William Williamson and from a studio almost within the shadow of the State Capitol at Augusta they produced "The Rider of the King Log." 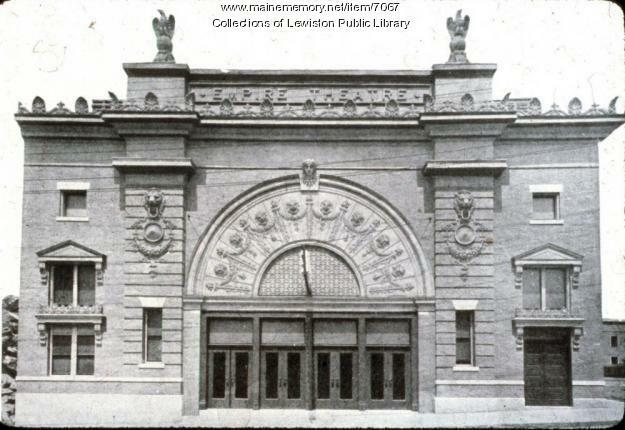 The first public showing of the film was at the Empire Theater here in Lewiston. New England audiences were interested in the picture because of its locale but Holman Day lost all his savings in his venture. Two more of his books were filmed on the West Coast — "King Spruce" and "Clothes Makes the Pirate" which was written in Hollywood and starred Dorothy Gish and Leon Enroll. When his funds were at low tide, he went to California in 1922 in an attempt to recoup his fortune. For three years he was a scenario writer for First National Pictures. But he i discovered that in the film making industry the author is the least important spoke in the production wheel. He was as out of place in California as a mayflower would be in the Everglades. He wrote to one of his friends: "The tough feature for a State of Maine Yankee here is that there are so few rainy days when one can sit in the barn doorway and gossip with the neighbors and whittle." After he became disenchanted with the motion picture industry, he moved to Carmel. Then, in 1931, he went to San Francisco where he conducted a series of weekly radio programs over the Pacific Coast Network playing the role of a Down East sea captain dispensing Yankee wit and wisdom. His lost years were very lonely. Financial problems and ill health drained the joy from his life. When he died on February 19, 1935, a new generation of Maine readers had grown up that scarcely knew his name. It scorns unbelievable, but for 13 years his grave in a Vassalboro cemetery was unmarked. Then his Colby College classmates discovered the situation and erected a stone. Now his books are collector’s items. They are treasured, not only for their rarity, but because they still make mighty good reading on a long winter's evening. So the next time you drive by the Holman Day house at Court and Goff St. in Auburn take a second look at the place where this genius produced tales of the north woods, the seacoast and the farms of Maine for a world that was not yet so sophisticated but what it could recall its grassroots beginnings. Material that some authors would use in a snickering fashion, Holman Day transformed into warm portrayals of a people tempered by the unique climate and soil of the Pine Tree State. I've read stories by Holman Day in THE POPULAR MAGAZINE and SHORT STORIES but never knew any details concerning his life. This article had many biographical details of interest. Any stories that stand out? Unknown here-I'm 87yrs.,but new to all this; trying to get my 'handle' up-in-lights...Chris Parker, here. Hi, Happy to hear from a new voice here. Welcome, and i hope you'll read some of the other articles and let us know what you like. I would have to go through my issues and see if I gave a Holman Day story an outstanding rating but I don't remember anything really standing out. I will say I do not consider him one of my favorites like Hugh Pendexter, Arthur Friel, Leonard Nason, Harold Lamb, Talbot Mundy, WC Tuttle, or even Francis Lynde. Happy New Year Sai!! This blog is a favorite of mine and full of interesting posts and comments. Happy New Year to you, Walker, and to all readers of this blog. I hope I have more competition also because I love talking about these old magazines and reading what other readers and collectors think about the pulp era.